With my last post on M&S screening work I got close to something fundamental: the valuation of leaders work. I was right that simple raiders are boosted in a sense that a bunch of simple raiders can't form a successful raid, they need a leader, who does the work of weeding out the M&S who want to be carried by them. However, my solution was no better than the one used in actual HC guilds. In HC guilds the leaders are volunteers, their work is not rewarded, so they are boosting the simple raiders. To minimize this work emerges the defining criteria of the HC guild: attendance requirement. A 10-men raid with 100% attendance need 10 raiders to be screened for M&S, one with 50% attendance need the leader to check 20 raiders. So it is the interest of the officers (as opposed to the raiders or even "progression"), to have as small guild as possible, and consequently as high attendance as possible. My suggestion was to make everyone be responsible for screening for M&S. This is merely a shift from soviet socialism (rich support poor) to Maoist socialism (everyone does the same work and have a steel furnace in the backyard). The solution is capitalism. If some people enjoy the benefit of a few professionals, they shall pay the price. It is much more easier for me to pay for my lawyer, than becoming a lawyer to be my own. In the guild, paying gold for well-geared people to boost less geared in ICC worked like a charm. So I extend it to the newly discovered form of boosting: raid leadership. I suggest raid leaders to charge the raid (from the pot) for leading the raid. For that he does the work of organizing the raid, checking the gear and performance of raiders. I suggest the payment to be per boss, just like boosters gold was. It is not a change in the rules, as everyone is free to organize any raids, and anyone is still allowed to join or not to any raid. Me, for sure will ask for 500G/boss for leading the raid. If you don't want to pay 50G/boss (50*10 = 500), find someone who does it for free or do it yourself! I really hope some will do and there will be more raids, to different places. The "burning out" is a typical consequence of doing unpaid, unvalued and hard work. Leading a raid is such. One who haven't done it has no idea how much work is behind it, and yet the raiders see nothing! The point is that they are in the raid exactly because they are fine. The absence of M&S is the product of the leader, but obviously no one will say "that was a great raid. Thank you that Arthasdklol wasn't here!". The M&S-free raid seems obvious, despite everyone knows that a group with no organizer (for example an LFD-heroic) tends to be terrible. Attendance-requirement, that decrease the officer workload a lot. The topic being unknown, so it's easy to find a new officer who runs the show for a few weeks, until he learns the hard way how much work it is. If we remove the attendance-requirement, the workload becomes unbearable, this is the reason that successful casual raiding guild do not exist. Note that "our guild did several icc bosses and we are casual" don't count, as I proved that trade pugs could do the same. ICC (and WotLK in general) was a joke, you could raid it with obnoxious M&S. My experiment with The PuG went closer than any other to the utopic "casual raiding guild", proving that the founding idea "asocial = not M&S" is at least a good correlation. We could raid without any serious leading, class officers and such. However I noticed that majority of the raids were lead by me, and that's a failure as it assumes my boosting (I'm very motivated in the success of The PuG, so I don't even notice how much I work for it). To make the system self-running, it must motivate the others to lead. What is the connection between the above and my asocial ethos? The above technical methods are morally unacceptable for social people. The "weak, unlucky, undergeared" player should get help and not he shall pay to the "strong, lucky, no-lifers"! The second point is an abomination for the socials as it says that "I must pay someone to defend me from the leeching of my friends". There is also a third reason: to have a raid without forced attendance, you need lot of people. We have 230 accounts and have problems filling 10-men raids, simply because people are not online, don't want to, or not prepared to raid. 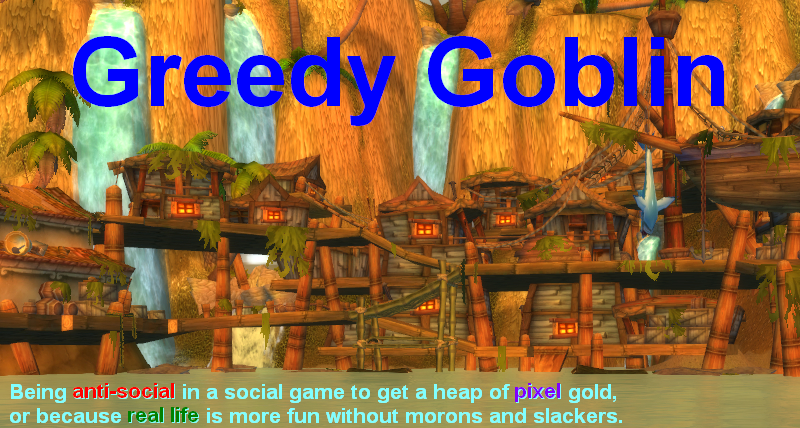 Such overbooking is impossible in a social guild, as the chat of a guild where "ppl can hav fun" is worse than /trade, when 50+ "fun ppl" are online. PS: the system can be applied to non-gold-bid guilds too, by giving extra DKP or some other form of loot-priority to the officers. The PuG update: little changes in the loot rules : There is no second bidder price for BoE items (the point of second bidder is to discourage people from excluding competitors from the raid, everyone is a competitor for BoE), also minimal bid is now 500G or Maelstrom Crystal price (whichever is higher) to follow the inflation. Ragga found this moron on the German section of the official forums. His plan: selling hypnotic dust for 10s to force a price decrease so the "little guys" can buy it too. I can't comment on the forum as I don't know how to say "buy and relist for 10G" in German. You said: "PS: the system can be applied to non-gold-bid guilds too, by giving extra DKP or some other form of loot-priority to the officers." Should it not have been "...some other form of loot-priority to the RAID LEADER"? What people that created trade pugs did on my server was ask for a "free loot", that meant that once per raid, they just took an item, no rolling. And trade people were ok with it, was less loot for them, but they had no other option as they were not able to raid with their "friendly casual fun social guild, everyone welcome" and when they tried to organize a trade pug themselves, it usually ended with half the raid leaving after wipe on ICC trash due to poor leading. Basically you are asking for the same, but because you do gold bid, you can ask for money. It might work, but some people might not be happy if most of the raids are led by you and they have to shed more money just to attend. Way back in WOTLK, GDKP raids were prevalent in Frostmourne (US) Horde. I speculated that the leaders of the successful ones could certainly charge the raid money to lead them. Some of these raids were so successful (11/12 HM ICC25) and earnt a lot of money (the pot is sometimes over the goldcap!). I think this is a really interesting idea, especially if you find a way for the potential raid leaders to compete for raiders time and money by publicising their previous successful raids. @Wildhorn: no. In a trade pug the raid leader do all jobs. However in a raiding guild the officers do several jobs making the raid leader's job simple: just lead the raid. They recruit raiders and remove M&S. I guess it's pretty easy to lead a Method or Paragon altraid since everyone knows his job. One of the assumptions, or concerns during the formation of The PuG when contemplating raid and loot rules was 'cliques are bad'. However, as guild size grows it becomes more and more difficult to recognize any particular guild member. For this same reason, military units are highly modular in that the largest units are composed of an increasing number of smaller units at each stage of the command hierarchy, so that the most common coordinated actions are always performed by a unit with high familiarity with each other, or when involving multiple units the internal 'quality' of the unit can be assumed without specific evaluation of each individual. Are the PuG's loot rules vulnerable to exploitation if a significant fraction of a raid group is from a single 'clique'? Would the emergence of such a culture, without loot preference in a raid, be harmful to the overall goals of the guild? 'Boosting' someone you might never raid again by analyzing their raid performance; vs paying a raid leader each time for a service for which it may be hard to establish a definite value; vs relying on and preferring 'references' of skilled players when forming a raid group. One of the goals of The PuG is that "anyone can join a raid as long as properly prepared", but at the same time it has been explicitly mentioned that the only protection against paying boosters from the pot or fining for poor performance is the possibility of avoiding that raid leader and joining a different one. It might have been a different 'exploit' possible by raid leaders, but reputation of the raid leader was definitely mentioned as protecting the rest of the raid from harm. When all analysis of raid members is done during the raid, in real time, the effort must be expended each time for every member. When the analysis can be done beforehand and during other events such as Heroics, there is no duplication of effort each raid but also the possibility of exploit due to that lack of effort, which is only outweighed by the real cost of detection of the exploit when it implies a loss of 'investment' that extends beyond the current raid. But does this reliance contradict the goals of the guild, is the question, or is the policy of "accepting anyone to a raid regardless of mistakes they made last time" only a policy that specific raid leaders can choose to adhere to? >If we remove the attendance-requirement, the workload becomes unbearable, this is the reason that successful casual raiding guild do not exist. I have to mention that one revelation while discussing with other players in the Guild Relations forum in Jan/Feb 2008, was that not only were guild alliances able to do introductory raid content of Karazhan and so forth, but there was also at least one server where a major guild would lead raids in high-end content (Hyjal/BT at the time, T6) with the raids including players from other guilds. During the same time frame (Dec 2007) certain servers were able to PUG T5 content (SSC/TK) competently with no single guild leading the raid. It's probable that the actual logistical cost of determining schedules before and leading up to a raid, is not nearly as daunting as the psychological pressure of admitting a conflict between WoW and other obligations, and that this is what has prevented casual raiding from being more successful in 'hard modes' in WoW. The main reason HC guild have attendance rules is progression - raids require training via repetition, and if you have to constantly train new people on the same fights your progression is considerably slower. You are also ignoring (as usual) the fact that HC guilds do have a very strong social aspect, stemming from spending a lot of time together in pursuit of a common goal. This leads to raiders often helping in the selection process for applicants, putting the good of the group before the group of the individual (because improving the group does more to further the individual's goal), etc. Nevertheless, you're right that leading is a difficult and mostly thankless job, and your solution is viable for GDKP/PUG raids. its "kaufen und für 10g neu reinsetzen"
I do not know why do you think leadership of good motivated players is a problem. It's easy to lead people who can be assigned to some task and figure the best way to do it without leaders help. One player told me about his experience when he was in 1st guild on our server. They of course use teamspeak. But except discussions during progress the usage of it was like this: "Pull" ... 10 minutes long silence ... "Good work". "Pull" ... 10 silence ... etc. Why is good to have attendance? 1) If you want to have fast progress you often rely on some people to do selected task. You also rely on some raid setup for the bosses in progress. And even good players must learn the encounter. I can see it every evening we progress. 3) Other problem is gear. If you have 20 players instead of 10 you must farm 2times more gear for them. 4) My experience is if the player can keep up the attendance there is very good probability it will be a good player. 5) HC players want to play not to talk. If they arrive on the raid and must wait for others they become angry. That's why HC guilds breaks. Not for some officer losing patience. It will be fascinating to see if your idea that leaders can be purchased actually works. Your encroaching on the debate "What motivates a leader ?" Your suggested solution is gold. I'm not convinced that gold motivates a leader, granted, gold or wealth often comes from successful leading but the initial motivation is usually something else. If you think about famous leaders their motivations range from oppression (revolutionary leaders) through to fear of failure (business leaders) and many things in between but I'm struggling to think of great leaders who have been purely motivated by gold. I'm sure your readers will suggest some. @Moron: Several already said that they will be simply reenlisted for higher profit. @Gevlon: Don't idolize HC-Raidinguild twinkruns. You would run mad, because none of them will take their usual farmcontent serious. Some will even turn into prima donnas if you criticize them. @paid raidleaders: I think it's a good way to motivate new raidleaders to take up the job, since there was only efford and no profit in the past. To quote you: "If you don't want to pay 50G/boss (50*10 = 500), find someone who does it for free or do it yourself!" - 50G per person is too low. We are talking level 85 here. Go with at least 100g per person. Every leader in history has been motivated by cash - to the victors go the spoils. As for myself, as an ex raid officer and guild leader I can only say that I wish that I had thought of this at the time. "Me, for sure will ask for 500G/boss for leading the raid. If you don't want to pay 50G/boss (50*10 = 500)"
Unless you're paying yourself, it would be 50*9 = 450. Flasks in my server are around 150g. Foods are not even listed, but I assume 30g each one if you farm the piece and find a cooker. (150/60)*3 + 30 = 37.5g in consumibles. Plus repairement, it would be around 40g. Regrouping would last another 3m, between eating, drinking and discussing strat, so it's 6m of a wipe. In an hour you have 10 trys, so you would spent 400 g. 500g for 2 or 3 hours of try is a lost for a good raid leader. I would recommend 250g per try. Also, I would encourage the other raiders to look for a good raid leader, not just the raid leader announcing its services. Yea, it was pretty common in GDKP runs on my server Tichondrius US for the raid leader of a run to take 10% of the total pot. No one really complained about it, all the rules were made very clear. However, if a raid leader took a piece of gear for their efforts in setting up the group and raid leading, all the people would be spamming trade chat calling the guy a ninja. 1)assuming there aren't m&s in the guild (GM's job in The PUG's case), the only thing the raid leader does is put the time up on the calender and maybe where the group is going. Everything else is more or less up to the group to get done and call out/change. If the RL has to hand hold through every raid, then yes he should be paid but really they need to kick people instead. In this scenario the RL's reward is running the run at times they can be online. There are always followers in a raid, but if in a 10m raid, at least 5 people aren't speaking up about things that go badly, progression will take forever. 2) You will have to change your loot rules on booster raids. When you start having hired guns/boosters in your raids, you should take away the boostees ability to get any gold back from the pot. Between the boosters and the RL (who could be hand holding the boostees+got the boosters) and the boosters who should be getting the same 10% bump as the RL does, the minimal amount of gold left might as well go toward extra profit to the people that don't need the help. You can't reward leaders per boss. Think of your time leading in ICC--how much leadership did it take to clear the first 4 bosses. And how much did leadership did it take when mastering Sindragosa or Arthas? Showing up for progression nights can be a significant problem if the reward system doesn't recognize the efforts of progression nights. Leftovers had significant problems with AQ40 as the system only rewarded boss kills. You're paying per boss recreates the same issue. Raid leads can be paid per hour--the market (your raiders) will punish those who only lead to get the cash--and pay those who get them the kills. Ideally the whole guild would pay for raid leads on progression nights as the raiders are already taking on the extra costs of wiping (and possibly flasks, potions and food). It seems overly simplified to suggest that there is only "HC" and "casual" raiding. Successful casual raiding isn't going to work if casual is defined as show up whenever you want, do whatever you want, etc. There has to be SOME level of expectations on how group members play...but that doesn't mean the alternative is hard-core raiding. I find your ongoing guild experiment to be fascinating. It is antithetical to my own guild's policies/values -- and, perhaps for that reason alone, I am extremely curious about what happens for you guys. The most fascinating part of WoW for me is how we overcome the barriers to collective action. I look forward to more posts. However, a small detail politely mentioned, your brief conceptualization of "socialisms" is theoretical and historically inaccurate which is distracting from your philosophical argument (as it has in other posts). Although I believe that leadership should be rewarded, the proposed scheme (including: fixed bid for loot, fixed rates for boosters, and fixed rate for raid leader) looks almost like a totalitarian government to me. With this intro I would like to make two suggestions to "The PuG" members. 1. By paying the raid leader a fee for leading the raid he become responsible for the success of this raid. As a result the members of a given raid are allowed to seek compensations from the raid leader if the goal of the raid is not achieved. The latter is in accordance with the legislation of all democratic countries. To give an example: The leader gathers raid for BH asking some fee for the organization. A given member makes stupid mistake and wipes the raid. At this moment the rest 8 player could/have to hold the raid leader responsible for allowing the idiot in the raid and may/should require some compensation at-least for their lost time. Of course, the guy who wiped the raid is responsible before the raid leader. But unless it is agreed otherwise the only possible punishment to the moron is expulsion from the raid. 2. Gevlon mentioned several times that there were not enough players online for a raid. In such cases, you members should sell your participation and make the raid leader pay it(probably from the pot). Unfortunately, to insist on those points you need to be inventive because the current game mechanics does not allow to have "raid democracy". BTW: After this post I decided not to join the guild. "If we remove the attendance-requirement, the workload becomes unbearable, this is the reason that successful casual raiding guild do not exist." Lack of an "attendance requirement" is a very bad definition of "casual raiding guild." Teams work better when teammates know each other. Players succeed when they learn how to play the game. If you take 10 entirely random people and throw them all into an encounter they have never experienced before, failure is practically certain. Even if you stipulate that all 10 random participants must have previously successfully completed the encounter, success is far less likely than with 10 people who have done it together. This is the definition of "raid progression." I run a casual guild. 63 members and in the neighborhood of 200 characters, only a small portion of which care to raid. We raid 3-4 hours, one night per week. I've never kicked anyone from a raid for lack of performance (though I have kicked some for being disruptive in various fashions). We killed every boss in ICC10 regular and did several on heroic, though burnout with ICC/WotLK started to set in just before we got to LK, so our progress from that point until Cataclysm was irregular. We're presently 5/12, having killed every boss The PuG has as well as Conclave of Wind (and BH, of course). We've also put in very good attempts on Maloriak (wipe at ~10%) and Atramedes (wiped under 2%) and advanced progression on Ascendant Council to phase 3. I fully expect that we will take down Atramedes next week, and likely Maloriak, too. There are some fairly rigid rules for joining my raid. Spots are assigned to specific people and at a recurring time every week. You are expected to show up on time and be prepared. You must have adequate gear (including gems and enchants, et cetera - I have not required any consumables, but it is encouraged). Finally, you must be willing to put forth the effort required to carry your own weight in every encounter. This is not a hard-and-fast performance metric. I have never kicked anyone from a raid because their DPS was too low or because they failed too many times on a specific mechanic. I have had to warn people that if they were not willing to at least try to improve, I would have to replace them. If someone is not interested in attending the raid anymore (i.e., gets burnt out, quits WoW, whatever), a replacement is usually found fairly quickly. Sometimes progression is lost while we teach these replacements fights others already knew, but it has never created a serious problem. If someone's attendance was terrible, I would certainly eject them from the group. I have replaced people who disappeared, and usually found out later that there was some "real-life" reason they did so. I have also banned one individual from joining my raid groups for being disruptive and uncooperative. I don't believe any of that qualifies us as "HC". Loot is assigned on free roll with no stated limit on number of items, but passing on an item which is of greater value to someone else is encouraged and rewarded by reciprocity. You can only take items for your primary spec, of course, though second priority goes to active off-specs. You can opt to pass on the item either before or after the roll, giving you plenty of time to consider whether you really want the item or whether you would rather someone else have it. Passing on an item rewards you with the expectation of future reciprocity and most likely with a slightly more competent teammate and therefore increase likelihood of future success. All of this if very standard anthropologically. No direct payment is required to change hands. My payment for being the "leader" is in the form of recognition. A good read! I'm standing on a line with 2 realms on each side and i'm not sure which way to go, but as it is now i'm enjoying both. Paying for a transfer + faction change is not an option. The PuG is an interesting project to follow and since there's no attendance rules i can watch calmly and decide what to do over time, as the guild evolves. I hope the rules motivate people and that the attendance increases.